What Is Receipt Hog? Can This Little Piggy Make You Money? Last updated on February 28, 2018 By Nat 4 Comments This post may contain affiliate links. We appreciate you supporting Rags To Niches! Full disclosure here. Receipt Hog Review: What Is It And Does It Work? Hey guys, I downloaded Receipt Hog recently and have been relentlessly uploading all of my receipts to this app – and having quite a bit of fun with it. Receipt Hog is a free and legitimate mobile phone app, that is designed to help you make a little bit of extra money, in a variety of ways. You upload a snap of your receipt to Receipt Hog via their app. You earn coins that you can save and exchange for rewards or sweepstake entries. You can also earn spins that you can use on their cute piggy slot machine. So, simply save your receipts, snap photos of them via their app and you save coins. You will be able to exchange your coins for Amazon giftcards or Paypal payments. 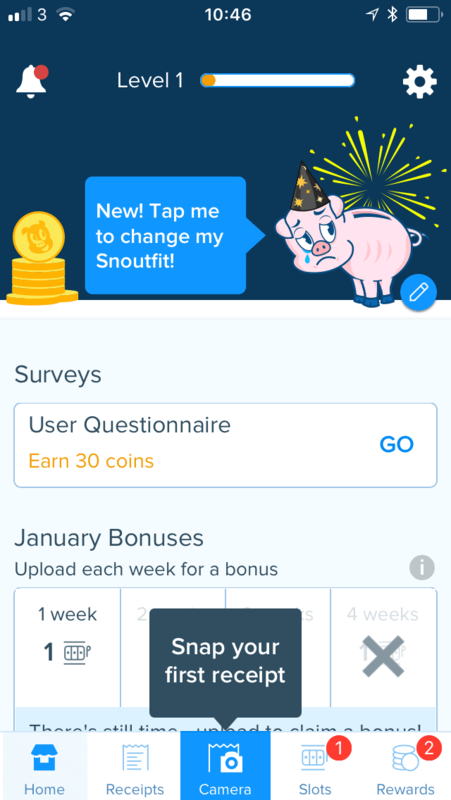 They also have a monthly draw where you can win 5000 points and additional ways you can boost your coins, such as by taking surveys, or connecting with them on social media. I have to say, I love the cute graphics at Receipt Hog! Fed up of making pocket change? Learn to earn more! The app itself looks great and I was really surprised that you could upload such a variety of receipts for rewards. It’s not as though you have to do anything taxing to get these rewards, you just upload your receipts. You can’t really get much simpler. From my perspective, it beats many other small-time money making opportunities, like spending hours answering dull surveys for next to nothing. I was thinking Receipt Hog was just going to be related to the big chain stores – but it’s not just your food shop receipt that you can upload, (although you can do that too). You can upload receipts from most regular stores – and even restaurants and coffee houses as well! So, every time you go out, whatever you buy, keep your receipt and see if you can earn from it. For example; if you’re a Starbucks fan, you can even upload your bill from Starbucks for rewards! Receipt Hog is currently available for you to download from the USA, or the UK. Getting started with Receipt Hog is super easy, because you can just join via Facebook and it’s fuss free that way. Once you’ve signed up, you can go through to their main informaiton page on the app. There you can complete a user questionnaire for 30 coins to get you started. You also get additional coins for certain tasks. For example; you can get 100 extra coins for connecting your email to Receipt Hog and 6 spins for connecting with Facebook. You even have an option to change the “snoutfit,” that your pig wears on the app. Kind of weird, but cute. There are different outfits for things like… what season it is. But you need to be at certain levels in order to upgrade your “snoutfit!” (more about levels later…). By uploading your receipts every time you shop, (whether grocery store items, health, beauty etc) you will earn coins. You can even use receipts that other members in your family have, (as long as they live in your household). The amount of coins you earn depends on how much you’ve spent, but I also believe it can vary depending on which retailer you purchased from. To give you an idea though…. Under $10/£10 = 5 coins. Over $100/£100 = 20 coins. You will also get an entry into their monthly sweepstake with each receipt you upload. You can upload up to 20 receipts on a weekly basis. 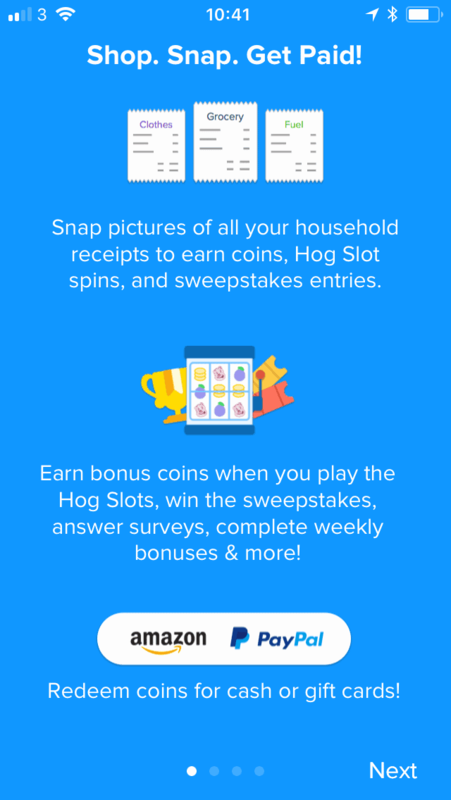 Every time you upload a receipt, you can also earn a spin on the hog slots. These receipts are from different stores than those where you earn coins. For spins, keep your clothing, office supplies, book store, electrical store, sports shop, home improvement, or arts and craft receipts handy. Personally, the HOG SLOTS are my favourite feature so far. It’s fun to play and you can potentially win thousands of points. I’ve no idea what the odds are of winning here, but it only takes two seconds to upload my receipt so… hey, why not! How many coins you get per transaction will vary from store to store and will also depend on how much you’ve spent. In order to cash anything out, you need to reach 1000 coin threshold and that will give you a $5 Amazon USA, or £3 Amazon UK voucher to withdraw. You don’t need to withdraw at that stage though, you can continue to save and withdraw when you have more in the bank. If you saved up to 4500 coins, for example; you could make $30 to withdraw, (or 5300 coins for £20) whether via Amazon or Paypal. So, it is worth saving your coins, as the more you have in the bank, the higher their value. For example; while 200 coins make up every $1/£1 when you cashout $5/£5…. This reduced to 150 coins per $1/£1 when you cashout $30/£30. I will say, I find the amount of coins you need to make that first withdrawal a little disappointing. It seems like it would take a long time to reach… but I guess that really depends how many receipts you’re uploading! I actually really enjoy this app though and find it easy to navigate and fun to use. In fact, I will probably continue using it from now on. I just wish it would pay out more than it does. >> To make a quick $5, have you tried Swagbucks? Once you’ve chosen how you’d like to withdraw, whether Paypal or Amazon giftcard, you should receive that within 7 days. Make Sure You Follow The Rules! One of the receipts was too old, (the transaction must be within 14 days). With another receipt, the transaction date wasn’t showing. But, I was pleasantly surprised by simply the other receipts went through. They had been crumpled in my pocket, so I thought they’d be rejected. The initial receipts I put through processed within 24 hours. I now keep uploading literally any receipt I have and seeing what happens. With apps like this, you can get your receipt rejected if you’re not careful uploading your photo and don’t follow the rules. You’ll want your receipt to be clear, with all the items easily visible, as well as the date of purchase and so on. If the receipt is long, you’ll need to take more than one photo. But either upload it to the app right away, (easy to do on your moblie anywhere) or stick it somewhere it can remain safe until you’re home. As an incentive to upload more receipts, this app also has different levels that you can strive towards. In total there are 25 levels and when you reach each level, you could gain bonus coins or spins on the hog slot machine. However, in order to level up to the top, you need to be uploading receipts every week. As long as you remember to upload and you shop, (pretty sure all of us shop somewhere at least once a week… ) then you’ll be able to do this. I took a look on Google play and saw that receipt hog has an average of four and a half stars, with over 60 THOUSAND reviews at the time of writing. So far so good. But I did want to see what negative things people had to say as well. 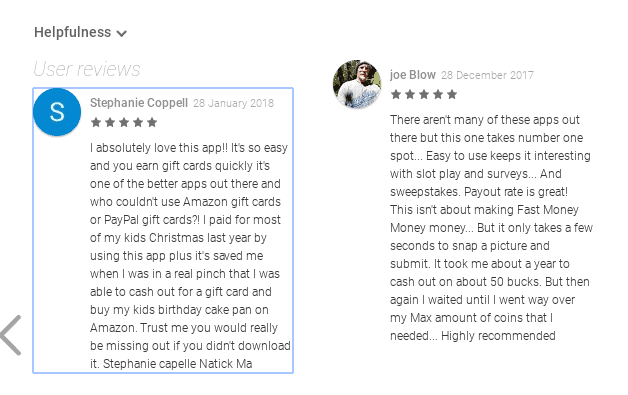 There are plenty of five star reviews out there, thousands of very happy customers and certainly good enough for me to check out the free app and give it a go myself. Some complained they knew no one who had one big on the piggy slots… have you won big with the piggy slot? Let me know in the comments. Some say it takes too long to reach the $5 threshold, let alone anything else. Some have complained about delays with payment, (but they do state it could take up to 7 days). Some claim they have relentless problems uploading receipts e.g Receipt Hog rejects them saying the receipt blurry, or a duplicate. From my own perspective, I notice they also do not have a referral program anymore. They used to have referral codes, but Receipt Hog recently stopped this. One of the ways I earn money from my websites is via affiliate marketing and many survey or cashback related sites have some sort of referral or reward program. That means you can be rewarded for recommending it to other people you know. It’s a win win situation for both sides, because it means you can get rewarded for sharing something you love and the company you’re recommending gets more exposure and sign ups. So, it’s a shame they don’t appear to have that right now and maybe they will again in future. Ultimately there are always going to be some complaints with these types of Apps or sites; nothing is ever perfect. My experience so far with receipt hog has been really good and I’m enjoying using the app so far. It looks as though there are still a large number of people who are very happy with it. Have you made money with receipt hog? Let me know in the comments. Does Receipt Hog Work? Or Is It Just A Scam? From my perspective Receipt hog is definitely not a scam, it has many thousands of happy customers who have made savings with them and enjoy using the App. There can be some issues with uploading receipts and I know that all too well from experiences with other shopping related apps. Receipt Hog works as a way to make a little extra pocket change here and there, but it isn’t going to make you any sort of substantial money. That being said, you still may well enjoy playing around with it and making some savings here and there. I know I will be uploading all my receipts from now on and I will update this post in future to update you how much I’ve made. If you’re looking for more substantial cashback rewards; you might want to try Ebates if you’re in the USA. I get a lot of cashback offers from Swagbucks and I recently started using CheckoutSmart, a UK cashack App. If you enjoy finding and posting deals – you can also get rewarded for that too, over at Dealspotr. If you’re looking at making more substantial money in the long term, then this isn’t the sort of thing that will do that. Several years ago, I came online looking for ways to save and make money online, as well as eventually start paying off some of our accumulated debts. I learnt how to set up websites and make start building up an income from them, via affiliate marketing. The good thing is, it’s something that anyone can learn. If you’re interested in finding out how you could do the same, you can access some free training over here. They teach you how to build an online business from scratch, in an area that you’re passionate about, or interested in. If you have anything you’d like to share about Receipt Hog… please leave a comment below! Wow, that’s a very in-depth review of Receipt Hog! I had never heard of this app until I read your review and now I’m anxious to try it out. I’ve heard of other receipt apps, but have always been reluctant to try them out, but after reading this review and seeing how easy it is to upload receipts to it, I think it’s time that I finally give it a try. I like the fact that you can upload receipts from many different places and that you can earn coins from them. Hey Brian, thanks your feedback… no problem! Give it a go and let me know how you get on.